Adorable vintage Sparky the gold miner from Sparks Nevada. Made of hand painted glazed ceramic with cold paint accents. 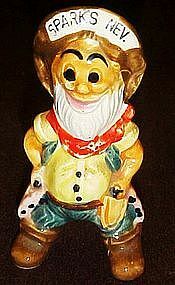 The little old cowboy measures 4 1/4" tall and is in great condition with no chips or cracks. He even has his cork.He does have some flaking to the red area on his neck kerchief, as you can see in the photo. Not sure if he is the salt or pepper, as he has 3 holes on the backside of his hat. I just have one, hopefully you have his mate.